Well, it’s that time of year again! Got kids? Do they grow? Then we’ve got a deal for you! Take a peek at our new junior buyback program. 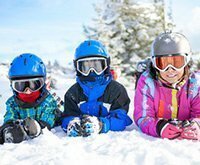 • If they get 2 years out of their skis and/or boots (kids most often do get two years out of their skis) we’ll give you 25% GUARANTEED. Our competition can’t say that. All we ask is that you bring in your receipt with the working equipment in, on or before Thanksgiving. If you buy new and trade it in the following year you’d pay $140 for the year, $90 if you keep them 2 years. Lease used and pay $109 for the year. So, new equipment is around a $30 difference. So whatever your decision is, it’ll be the right one! Remember, when you buy from us you’re not only buying local, helping the local economy and your fellow neighbors take care of one another, you’re buying from a trusted, knowledgeable source, which is why we’re the oldest Ski and Sport shop in New Hampshire.